Make the dough: Put 2 cups boiling water, 4 ounces lard and 1 1/2 teaspoons salt in a large mixing bowl. Stir to melt lard and dissolve salt. Cool to room temperature. Gradually stir in flour with a wooden spoon until dough comes together. Knead for a minute or two on a floured board, until firm and smooth. Add more flour if sticky. Wrap and refrigerate for 1 hour. Make the filling: Melt 3 tablespoons lard in a wide heavy skillet over medium-high heat. Add onion and cook briskly, stirring, until softened and lightly browned, about 10 minutes. Add potatoes, corn, garlic, cumin and thyme. Season generously with salt and pepper and stir well. Add about 1 cup broth or water and simmer until potatoes are softened and liquid has evaporated, about 5 to 7 minutes. Transfer mixture to a large mixing bowl. Add roasted peppers, ham, ricotta and cayenne and stir well. Taste and adjust seasoning for full flavor (intensity will diminish upon cooling). Stir in Gruyère and scallions. Cool to room temperature, then cover and refrigerate until ready to use. Divide chilled dough into 1-ounce pieces and form into 2-inch diameter balls. Roll each piece into a 4 1/2-inch circle. Lay circles on a baking sheet lightly dusted with flour. Moisten outer edge of each round with water. Put about 2 tablespoons filling in the center of each round. Wrap dough around filling to form empanada, pressing edges together. Fold edge back and finish by pinching little pleats or crimping with a fork. Heat oven to 375 degrees. Place empanadas on parchment-lined or oiled baking sheet, about 1 inch apart. Brush tops lightly with lard or butter and bake on top shelf of oven until golden, 10 to 15 minutes. Serve warm. Dough and filling may each be prepared a day or two in advance. 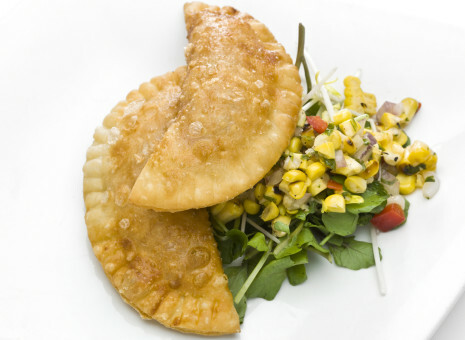 The empanadas may be assembled several hours ahead of time and refrigerated, uncovered. Bring to room temperature before baking.